I don’t do breaking news – there are way too many ESC sites out there that do it already, and I am both too unwilling and too lazy to compete with them. However I do occasionally do collective news, and that is what’s on the agenda today. Here’s an overview of the JESC12/ESC13 story so far. This year’s JESC will be the 10th edition, and is scheduled to take place on December the 1st in the Heineken Music Hall, Amsterdam (there’s no sponsor for a children’s song contest quite like an alcoholic one). The Netherlands will be the first country to have hosted it twice, after the 2007 edition in Rotterdam. I hope they make the most of it, because they aren’t likely to be hosting big Eurovision any time soon…#harshbuttrue. Similarly, Kim-Lian van der Meij will become the first person to co-compere the show twice. Let’s hope she can refrain from telling us that she’s so excited she could wet herself this time. Either that, or that she and Eric Saade get together. Apparently they both enjoy making mention of their full bladders on live television. 8 countries have confirmed participation so far – Armenia, Belarus, Belgium, Georgia, the Netherlands (I should hope so), Russia, Sweden and Ukraine. Italy, Moldova, San Marino, Serbia and Spain are still mulling it over. Unfortunately, Bulgaria, Lithuania and Latvia have withdrawn, which means no superheroes, no clouds and no moondogs for Amsterdam (and possibly no Amsterdam either, but I’ll get to that in a minute). 2 songs have been selected, with Russia recruiting last year’s Moldovan entrant Lerika to sing Sensatsiya, which roughly translates as ‘I’m still pissed that I didn’t wipe the floor with everyone else in Yerevan so I’m back for revenge’. Sweden, upgrading to Lilla Melodifestivalen from last year’s non-event national final (a la Greece’s shopping centre showcase for Baku) will be sending a less familiar face in Lova Sönnerbo, and a humble ballad in Mitt Mod. I will be reviewing all the songs in full when the time comes, but for now I will say that Russia has the edge, and not just because Lerika is hell-bent on getting her hands on the trophy and will probably run over all of the competition with her scooter. Lova doesn’t stand a chance. Ukraine, who always bring it to JESC and ESC but have flailed over the last few years in the former, will pick their entry this Sunday from a selection of approximately a gazillion. I personally could not muster up the strength to listen to them all, so the winner will be news to me; but Annika (www.sternenstaub-esc.blogspot.com) did (impressive) and has also reviewed them (double impressive!) so head here to check out what’s on offer from the 2009 host country in 2012: http://www.sternenstaub-esc.blogspot.com.au/2012/06/jesc-2012-ukraine-2012-reviews.html. What will be, will be…but will there be JESC? At this point, the number of confirmed countries is half the number that competed in the inaugural contest in Denmark, and positively paltry in comparison to the record number of 2004. Even worse is the fact that eight is not enough (no matter what that old TV sitcom said) to keep the traditional Eurovision point system of 12, 10 and 8 to 1 in use. Sure, the system could be altered to fit, but I get the feeling the organizers wouldn’t view the show as worth putting on at all if that had to be done. I think it’s up to at least three of Italy, Moldova, San Marino, Serbia – who last entered in 2010 – and Spain – who last entered in 2006 – to confirm in order for the show to go on. There really needs to be eleven participants, so come on! It can’t be that hard to find some precocious singing child to send to the Netherlands for a few days in December, can it? If you’re short on cash, drive them there yourself and make them a costume out of takeaway food containers. Just MAKE IT HAPPEN, so Lerika and Lova and whoever gets selected to represent Ukraine this weekend don’t have their fragile hopes and dreams destroyed. And so that I have an excuse to buy a truckload of sugary crap to consume at 3am whilst watching the contest on my laptop. This is more like it: 21 countries have already confirmed that they’ll be gracing Sweden with their presence next May, which means we’re guaranteed at least one semi final. They are Albania, Armenia, Austria, Belarus, Bulgaria, Denmark, Estonia, Finland, Hungary, Ireland, Israel, the Netherlands, Norway, Romania, Slovenia, Switzerland, France, Germany, Spain, Sweden and the United Kingdom. Yes, Sweden will be there. What a relief! It’s also great to see Armenia back on the list after an understandable hiatus this year. I couldn’t help noticing how quickly they confirmed, which makes me think they want to remind Azerbaijan that they were the problem…but let’s not get too into that issue. It’s also worth noting that many of the countries above had a bad time in Baku, results-wise, i.e. Austria, Belarus, Norway, France and the UK. Kudos to them for getting back on the horse, and better luck next year. On the ‘possible’ front, it looks like Andorra won’t be making its first appearance since 2009, if the prime minister is to be believed – but since when could we believe the declarations of political figures? (That was a joke. Please don’t kill me.) Anyway, there is a chance that Liechtenstein will make a debut, so keep your eyes peeled for developments there. If only Poland and the Czech Republic would give it another go. Then we’d be on track to the biggest ESC of all time, which would make me feel a little better about the whole Junior debacle. The preliminary dates of the 58th ESC are May 14th, 16th and 18th, and that’s probably how things will stay. As for where – well, we’re going to Stockholm! – Stockholm hosted the contest the last time it was in Sweden, in 2000. If they nab it again, it’s goodbye Globen and hello Friends Arena. 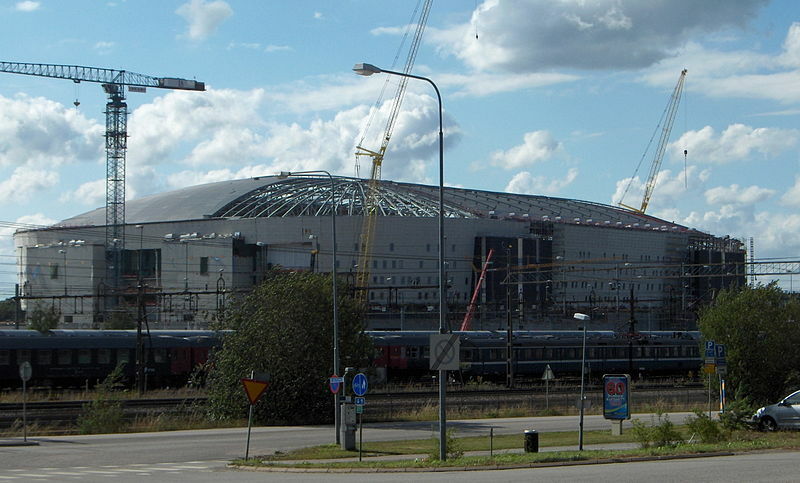 Formerly known as Swedbank Arena, this venue is currently under construction and will reopen in October with a measly 67 500-seat capacity for concerts to its new name. – When I say ‘measly’, I of course mean freaking massive. Even if that amount were slashed in half to accommodate the stage/green room/wind machine storage facility etc, it would still offer the largest ever amount of seating for an ESC. To give you some perspective, the largest offering to date was 25 000, shared between the Telenor Arena in Oslo, the Olympic Indoor Arena in Moscow, and the Belgrade Arena. – The Friends Arena has been pre-booked for the Melodifestivalen final in March, and is supposed to host the Svenska Cupen final a few days after Eurovision, but apparently that can be postponed to the end of May to make way for the contest. What a refreshing change to have Eurovision put before (yawn) a sporting event! I think it’s safe to say that Stockholm wants it bad. – More proof: in addition to renovating the Friends Arena, hotels, parking areas and only the largest shopping mall in the Nordic vicinity (swoon!) are being built nearby. Stockholm: can accommodate Eurovision much? – Malmö is humbler by comparison, but as they say, it’s quality, not quantity. The city has put forward Malmö Arena (I wonder why they called it that?) as their venue, which has a capacity of 15 500 for concerts. It may be smaller, but it works – the arena has played host to many a Melodifestivalen semi. – It’s also said to resemble Helsinki’s Hartwall Areena, the location of Eurovision 2007 which was a big success (and will always be my most-loved edition). Whew! I don’t know about you, but I’m all newsed out, so I’ll end this post with something new, but not newsy. Does that make sense? Ahh, just geddon with it. Basically, in a week or so I’m going to start posting a countdown of my top 50 Eurovision songs of all time. This is something I never thought I’d do because I figured it would be impossible – and believe me, it has not been easy. But I have finally completed my list, and I’m pretty excited to share it with you. I thought it would be even more exciting if you guys did it with me, so if you’re interested, get listing! I’ll be going backwards from #50 all the way to #1, so with each installment, I’d love to see yours. This is a challenge I’m issuing to anyone reading this, but it’s ultimately a fun one, not a Hunger Games-type one where you may not make it out alive, so please join in. I can’t wait to see how diverse the rankings are. With 1000+ songs to pick from, they’re bound to be.